There's a park with river access near my house. I like to wheel my kayak to the park and kayak up and down the American River. However, I must remember to turn around under this bridge or else I'll be pulled into the rapids downstream and I won't be able to paddle back upstream. Kayaking on the river is strange because there are enormous rocks in the water that suddenly come almost to the surface and give me a sharp attack of vertigo. This bridge's columns have that nice texture that they glue onto the concrete forms before they pour the concrete. The column's style seems very 1960's to me, but I don't have any information about when it was built. I do know that it is a six span, reinforced concrete box girder bridge on single column bents and its about 1000 ft long. 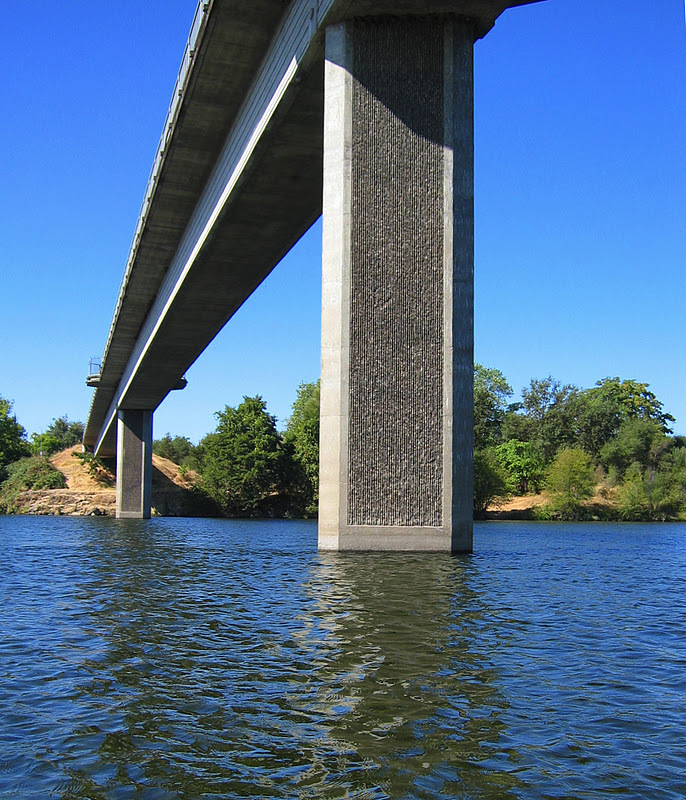 Like yesterday's Fair Oaks Bridge, the Harold Richey Bridge is owned by the Sacramento County Parks and Recreation Department. This bridge is usually crowded with families and cyclists, especially on the weekends. There are elaborate rules on the bridge deck about the right-of-way for pedestrians, equestrians, cyclists, etc. that I've never quite figured out. The bridge is named after Harold M. Richey and it was dedicated to him in 1987. I think that Richey was a county commission who was a strong supporter of the bike trail, and the bridge was dedicated to him after he died. American River Bridges: Harold M. Richey Memorial Bridge by Mark Yashinsky is licensed under a Creative Commons Attribution-NonCommercial-ShareAlike 3.0 United States License.